The uproar over swine flu, or the H1N1 virus, has been going on for days now. As current strain of flu virus originates from Mexico, people in Asia are not as exposed to risk as our western brothers. However, due to the ease of travel from any part of the world today, there really is no guarantee that the virus will not reach the farthest corners of the world. How many users have made right decision? ! Our company is a professionally managed distributor of generic drugs. 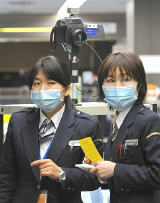 Japan’s Health Minister Yoichi Masuzoe said a 17-year-old boy may be the country’s first swine-flu case. The teenager, a high-school student from Yokohama, near Tokyo, visited the western Canadian province of British Columbia from April 10 to 25, according to public broadcaster NHK, which televised the news conference by Masuzoe this morning. The youth underwent a medical checkup yesterday after coming down with a fever and cough. Preliminary tests suggested he may have swine flu, NHK reported. The National Institute of Infectious Diseases in Tokyo is conducting additional tests to confirm the diagnosis, the report said. With everyone as alert as they are at the moment, people arriving at international airports are scrutinized closely for any possible signs of flu. As a matter of fact, another woman arriving from Los Angeles was suspected to have the flu as well. After further tests, however, it turned out that she had another strain of flu. While you are probably safe if you have not traveled to high risk areas or have no plans of traveling in the near future, it is always wise to employ good hygiene practices.